It’s time for a belated Home Bakers again… oops! Sorry for the delay! I baked this cake twice as I wasn’t very happy with the first attempt, hence missing the dateline for this bake. 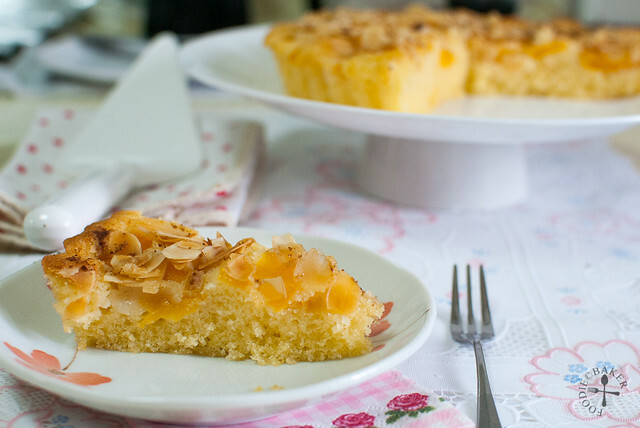 This time, we are baking a very simple peach butter cake, chosen by Chaya from Bizzy Bakes – I really love how pretty this cake looks, with all the peach slices and almond flakes adorning all over the cake! 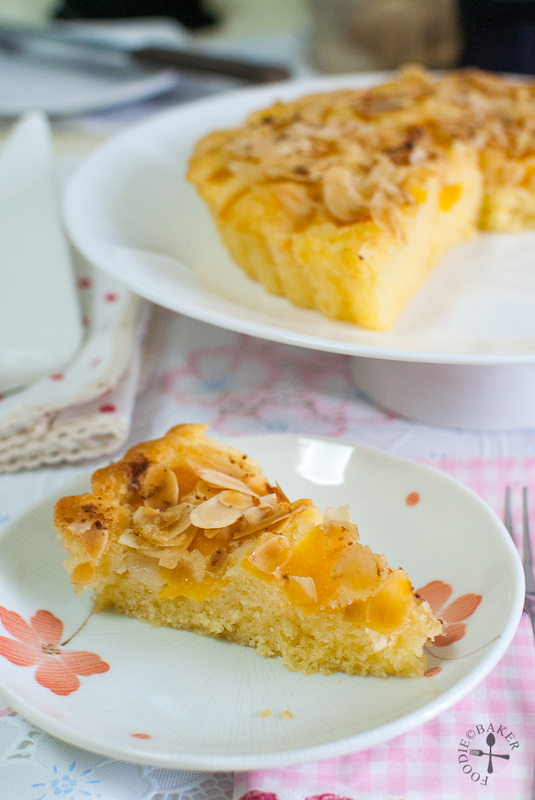 This butter cake is nice, fragrant, rich and soft with bits of peaches and almond in every bite. This will be a great cake with tea or coffee! And here are the step-by-step photos! 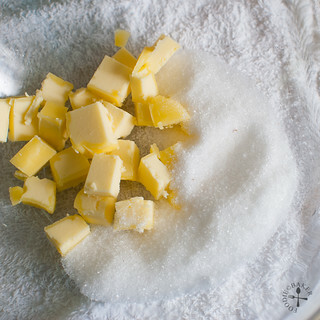 1) Cream butter and sugar together. 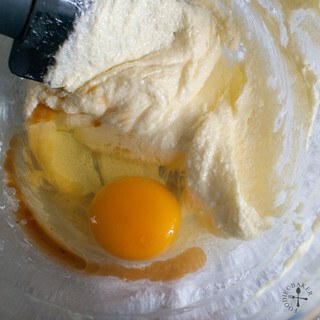 2) Beat in the eggs and vanilla. 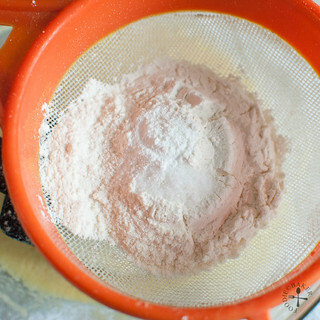 3) Sift in flour, baking powder and salt. 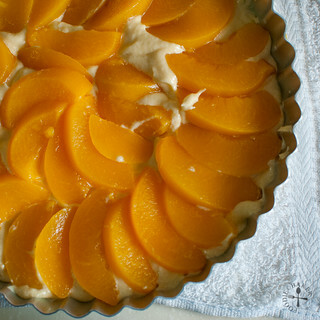 4) Spread the batter and arrange the peach slices. 5) Scatter toasted almonds all over. 6) Top with brown sugar and bake away! I only need a cup of coffee or tea and it would have been perfect! As part of the rules, I’m not allowed to post the full recipe, so I’m listing down the ingredients I’ve used and some notes. For the full recipe woth instructions, please head over to Chaya’s blog! For all other Home Bakers attempt on this bake, please head over here to see the roundup! For the steps, please head over to Chaya’s blog! 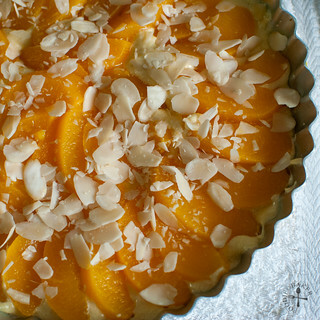 I used canned peach halves and swapped the cashews for almonds. Rinse the peach halves in water to get rid of the syrup then dab the surface dry with a kitchen towel before slicing so that the peaches will not add too much moisture to the cake. As the butter cake uses very few ingredients, it is essential to use very good quality butter and vanilla so that the rich buttery taste and the fragrant vanilla flavour can come through. Store the cake in an air-tight container in the fridge for 3 days. Let the cake come to room temperature before serving. This is indeed a lovely coffee cake. I brought kopi o to enjoy your cake.. LoL..
Oh dear Lena, so sorry to hear about your cake! 🙁 Try baking a second time? The cake’s quite worth a second bake! Good luck in your next bake! Jasline , sometimes it is much better to make the full recipe 😀 I remember my attempt on making rugelach , I’ve made half and the crust is so thin , I can hardly roll it since it was sticking on the parchment paper . I had to chucked it out , goodbye 1/2 cup of butter *sigh* Anyway , that coffee cake looks perfectly-baked and I bet it taste as delicious as it looks ! Your cake looks very pretty! I realise too that this is going to be a flat cake but decided not to bake it because I was running out of time :p Keeping up with all these events are exhausting ! Hi Zoe, yes there are so many events going around! I’m sorry I couldn’t catch up with quite a lot of Bake Along events, I missed the latest Cinnamon Bread one… hopefully I’ll be able to slot in some time for tuiles, been wanting to try making it for a very long time! Peaches and almonds! Yum! Two of my favorites. 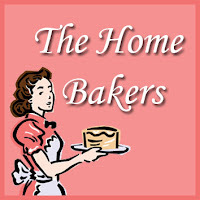 I’m happy to know they are your favourites, I hope you’ll bake this cake to give it a try! Your peach cake is really pretty! Love it that you made it in a pie dish. Wow! that looks awesome! 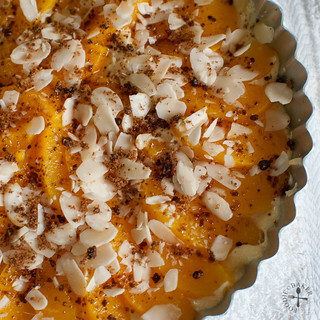 I would love to bake this too if I have the time….gorgeous! This looks beautiful! Mmmm wishing for a slice of this now LOL. Thank you, hope you are not drooling too much in front of the computer! Your cake looks wonderful! The peaches on top, looks so sunny and bright, just lovely! Yes, this is a very nice cake for snacking! Hi Joyce, thank you! Yea my friend finished 2 big slices of it for her breakfast! Haha! You really did create a beautiful coffee cake, Jasline. 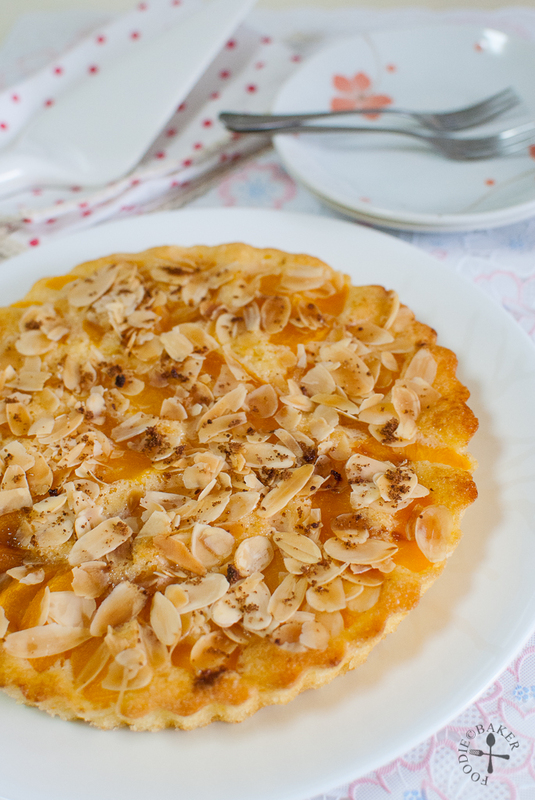 The flavors of peach and almond compliment each other so well. This must have been delicious. ps: what happened with 1st cake? Hi Emily! I baked only 1/3 of the cake the first time so the cake base was very flat and I didn’t dry the peaches, so the cake was too moist for me! NVM, you are well rewarded with your second bake, good job! 2nd time’s a charm! Looking FAB!